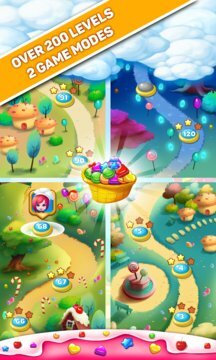 Join journey to rescue Gingy in Candy colorful world! 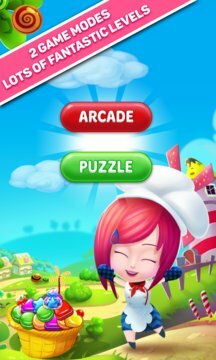 A great experience with match 3 game series has become familiar in the game now have Candy wonderland. Step into the world of sweet candy cookies, candy, jelly, Cupcake, Biscuit, Dessert ... colorful, extremely attractive promises to bring to you a challenging adventure! * You will explore map 200 Level diverse challenges. * The weapon variety will help you move easier on the way to the finish. * Collect as many candy tablets to be discovered interesting stories candy and earn the highest score. * Easy operation but also not easy to challenging achievement 3 stars for each level. * Sounds fun, eye-catching images, lovable characters. * Many special candies such as candy time, doubling candy, candy witch ... will get you closer to victory. Arcade: Please rescue heroes are trapped in piles Gingy candy and jelly members broke out in the prescribed time period. Puzzle: Assemble a sufficient number of members to pass each level Candy with limited moving plays. Game Candy wonderland for FREE will give you hours of fun, entertainment, comfortable and extremely interesting. Thank you for accompanying us!